3rd times the charm 9-18-17. 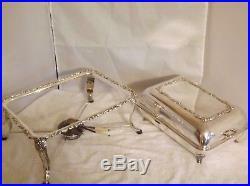 A stunning 6-piece buffet chafing dish beautifully detailed with roses and paisley style scrolling. This set includes a stand with four legs, a large entrée pan with feet, a double divided vegetable dish, a handled lid, an alcohol burner and flame snuffer. 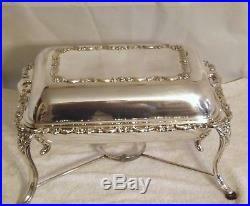 Silver plated; Food areas are stainless steel. Pattern: Roses, Floral, Swirls and Paisley Style Scrolling. 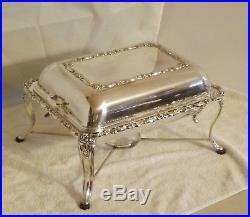 Covered Chafing Dish includes: Stand, Two Inserts, Lid, Warmer and Snuffer. Overall Dimensions: 9.5H x 16L x 11.5W. 6 Piece Set Includes. 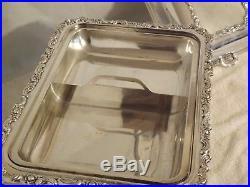 The pan has a silver plate outer and is stainless steel on the inside. Made to be removable and has decorated feet so you have the option of sitting it on the table, separate from the stand, when serving. The bottom has lovely, subtle circular swirls. Has a faint circular area on the inside from the burner. Holds approximately 3-4 quarts and measures 3.25H x 14.5L x 10W x2.5D. Divided Vegetable Pan Insert. This pan is removable but when in use on the buffet it sits inside the entrée pan. A 2 2/3 center divider has a handle for easy removal and each side of the 2-part partition is 7L. Shows some wear with some tiny spots and scratches. Holds approximately 2 quarts and measures 1.75H x 14L x 9.5W x 1.75D. 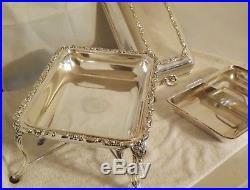 The large lid has a silver plate outer and is stainless steel on the inside. The cover is exquisitely detailed on the top with roses and paisley style scrolling. Has three very tiny spots and one small loss area by embellishment on top (see pics). Measures 2.75H x 14.25L x 10W. 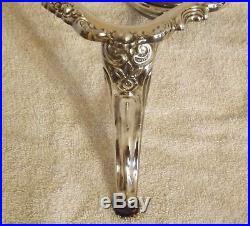 The stand is silver plate with matching roses and scroll trim. Four long legs allow it to sit at the perfect serving height. The legs feature matching embellishments, are slightly curved and have rubber pads to keep it from scratching your table or surface. The bottom has a spot in which to put the single warmer. 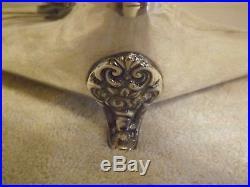 The warmer is silver plated with a wrapped handle. The top rotates to allow for adjustable heat temperature. The inside has screening and is made to be filled with alcohol for burning. This piece needs a good polish and cleaning. Matching silverplate snuffer to safely put out the burner and features a wrapped handle (the inside of the snuff area is stainless). 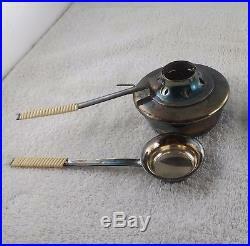 Note that you do not have to use the alcohol warmer; you can use a canned warmer like Sterno instead if you wish. Excellent Pre-Owned Vintage Condition. No major problems, normal wear from use please read each section above for specific condition details for each piece. Needs another polish (the warmer needs a good polish). 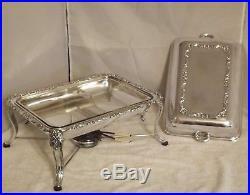 The set is silver plate with the exception of the inside of the lid, the entire vegetable pan and the inside of the entrée pan. Perfect for family dinners, dinner parties, party, Christmas, Thanksgiving, catering, Easter, chafing dish, server, chafing pan, buffet, serving platter, bake ware, cookware, double, 2 part, 1 part. Final Sale; As is preowned. 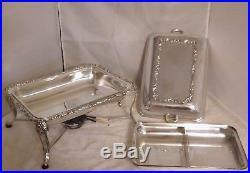 The item “6-pc Silver Plate Covered Buffet Server Chafing Dish 2 Pans Burner & Stand Vtg” is in sale since Thursday, November 16, 2017. 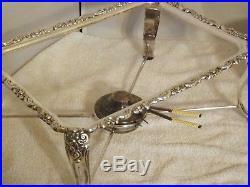 This item is in the category “Antiques\Silver\Silverplate\Other Antique Silverplate”. The seller is “bestdressed_formalwear” and is located in Walhalla, South Carolina. This item can be shipped to United States.